Day 9 was adopted by @GallusEffie for some beach art. While it has been suggested this would be an ideal environment for the Commissioner Ostriches to bury their heads, none were spotted in Kirkcaldy that day. However there were a few doggies… GallusEffie has resurrected her blog to share her day, which was rather special, you can read the full story here. Brought forward by weather deterioration and parental wedding anniversaries, congratulations on 50yrs together May and Archie, we are sharing today the beach art for LB. 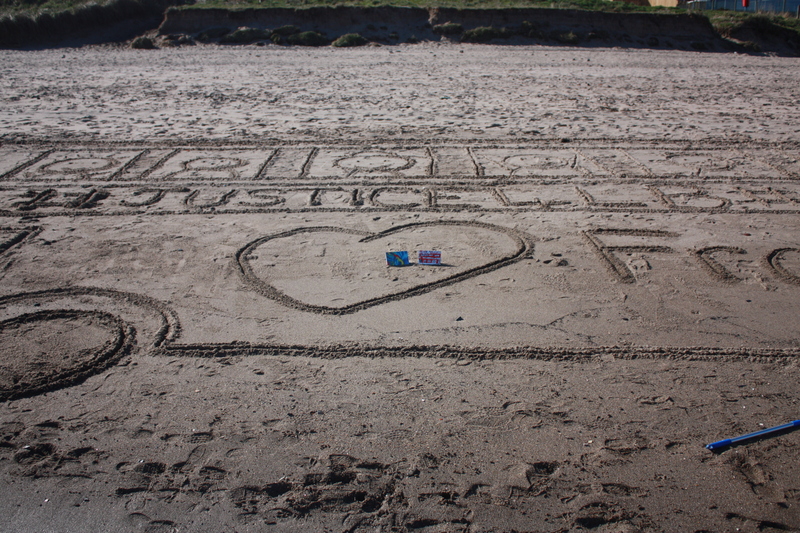 If you’re inspired by GallusEffie’s creativity then feel free to get making sand buses too, and send us your snaps. I first “met” Sara and LB on Twitter in 2012 and we soon chatted passionately and amicably about our common loves and hates about being mums to incredible dudes with additional needs. I remember in particular a conversation about filling out the ludicrous DWP form to apply for ESA…”can you pick up a pen?” “can you set an alarm clock?” – another instance of proving inability to the authorities that we’ve been doing since the get go…and it was a relief to talk/rant with Sara because she understood my exasperation exactly. I won’t go into detail about the #JusticeforLB campaign here, I feel utterly inadequate to the task of capturing anything but the tiniest flavour of horror, outrage and disgust that LB died a preventable death…but there’s also the feeling of tenacity, forensic analysis and solidarity amongst the #JusticeforLB posse. I’m not an artist but enjoy having a go at creative things and thought it would be good to draw a big bus on one of our many beaches in Fife and send in a photo. As it turned out the beach I wanted to use had a lot of cranes, diggers and security fencing at it (they’re improving the sea defences) and much of the beach was out-of-bounds to the public…so we went much further along, parked the car and headed down. There was a difficulty in that this bit of the beach had a lesser slope leading down to it, so the photos were hard to take from a height. Thankfully, Mr Effie had a set of stepladders in the boot and he was a very capable artistic director and photographer! We were “invaded” a couple of times by dogs, including a snarly wee shite called Chicco, and had a lovely chat about LB with a couple from Coventry up in Fife on holiday, turned out they have an adult daughter with speech and language difficulties and the dad drives the Tesco bus for a living….love, love, love that coincidence. You’ll need to visit GallusEffie’s blog for all the photos and a step by step guide to recreating your own bus. These are just two to give you a flavour. It really is worth checking out all of them. ps You can get the postcards on the bus here. 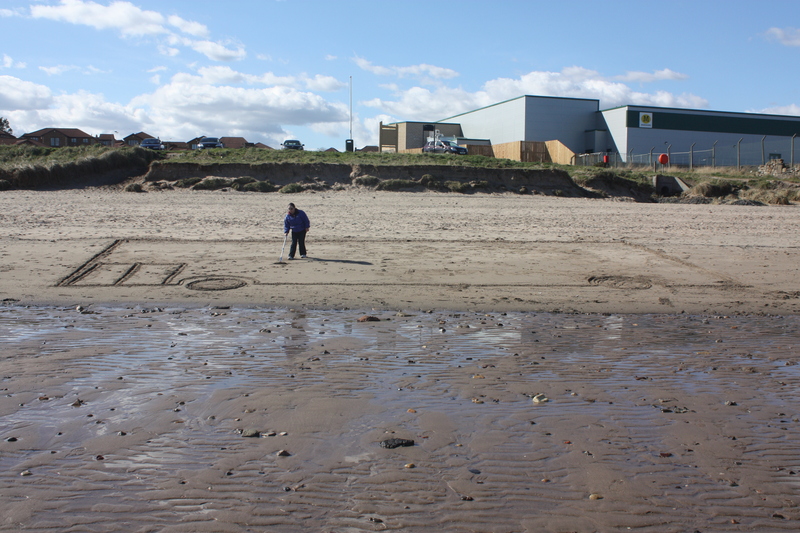 This entry was tagged 107days, beach, beach art, bus, fife, galluseffie, justiceforLB, kirkcaldy, lbbus. Bookmark the permalink.